I'm expecting problems in cases where the UI becomes invalid due to the re-enumeration of disks/drives. Things to test for would be scenarios where the selected drive in any of the ~8 combo boxes showing drives/partitions is removed, when a preselected drop-down box item is cleared but not re-selected, etc leaving the form in an invalid state. This update is less-specific than previous builds, and changes quite a few things up beneath the hood. Will require more testing. * [EBCD-542]: Fixed EasyBCD crash on startup if settings file in %appdata% is corrupted, outdated, or unreadable. As you can see, many changes. Feedback is appreciated. Good luck and happy bug busting! This build resolves all known issues with USB deployment on EFI machines. The biggest changes in this build are to the automatic upgrade. 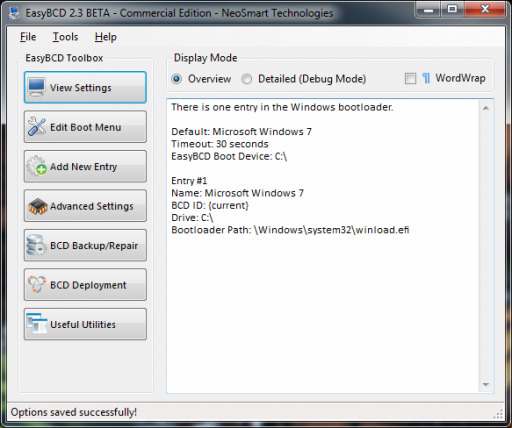 EasyBCD now supports in-app update notification for beta builds separate from stable. Users running beta builds will be notified of either stable or beta updates to the software. Users running stable will only be notified of stable updates (which means you'll need to install a beta build after installing a stable build to get future beta build updates. This may change with an option in the about page, perhaps persisting to "check for beta updates" if the user ever used a beta build). Please report any issues you are having with Windows 10, as it is nearing release. I am investigating ongoing issues with the metro bootloader not showing even when the option is ticked in EasyBCD and welcome all input on this topic. Ladies and gentlemen! It's been a while, and hard as it is to believe, EasyBCD development never truly stopped. Beta build after beta build collected dust on the development PC as new features were (slowly) added, but plans to hold back on a beta release until sufficient changes were implemented had the ultimate (and much-undesired) effect of putting off the launch of the EasyBCD 2.3 beta for quite some time. All that changes, today we have a fresh beta build of EasyBCD hot off the compilers and ready for testing. EasyBCD 2.2 has been rock-solid and truly stood the test of time (and the release of an OS and "service pack" to boot), so don't expect any enormous changes, but EasyBCD 2.3 does bring some longer-awaited changes to the table. 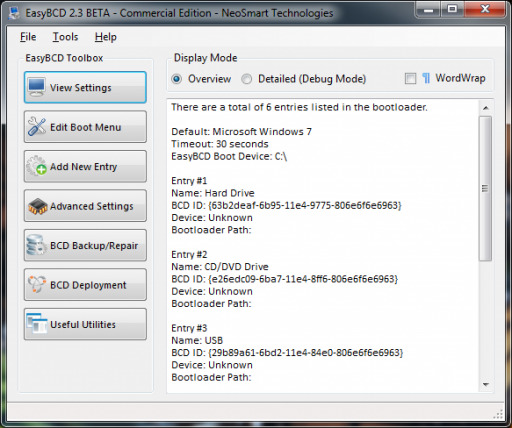 So, biggest changes are improved EFI support and full Metro UI options for the bootloader. Personally, I don't like the Metro bootloader, but a lot of you have asked for this feature. Note that the metro UI will only appear if the Windows 8 bootloader is in place (i.e. one or more of the Windows installations on the machine is Windows 8/Server 2012). 더 이상 무슨 말이 필요하랴 !! !